TNT has given script orders for several potential series, including two crime dramas. H.I.K.E. features a police officer, who runs the … are you ready for this? … Home Invasion Kidnapping Enforcement team in Phoenix. Let's hope they change the name if it gets as far as the pilot stage. Perfect Set — ugh, another awful title — concerns a brother and sister, who solve crimes … and is being described as a Hart to Hart-type drama. Huh? TNT has a pretty solid record to date for airing interesting and watchable crime dramas, but we think these two, based on admittedly sketchy details, aren't all that appealing. What do you think? We were linking our way through the internet as we are sometimes wont to do and stumbled upon several new crime dramas and made-for-television movies premiering this fall on SVT, Sweden's television network. Not that it's likely we'll see any of them soon here in the US — still, they all sound pretty interesting to us — we suspect that plans are already underway somewhere by somebody to make them available to a wider audience. Arne Dahl consists of ten 90-minute episodes of adaptations of the books in the InterCrime series of crime novels by Arne Dahl (a pseudonym used by Jan Arnald). If we're reading our translation correctly, it seems as if five novels have been adapted, each airing as a 2-part episode: Misterioso, Ont blod, Upp till toppen av berget, Europa Blues and De största av vatten. Of these, only Misterioso has been translated into English (and coincidentally recently reviewed by us at Mysterious Reviews). Anno 1790 is a historical crime drama set in the late 18th century and features Inspector Johan Gustav Dåådh of the Stockholm police. Our reading of the synopsis suggests to us that this is a straight-forward police procedural, albeit with political undertones. It is scheduled for ten 60-minute episodes. The description of Bron reminds us of The Killing, though more the Danish version than the American version. A mysterious murder has taken place on the Oresund Bridge, forcing the Swedish and Danish police forces to work together to solve it. Ten 60-minute episodes have been produced. Finally, a 90-minute made-for-television movie adaptation of Anders Roslund and Börge Hellström's first thriller, The Beast (original Swedish title, Odjuret, which is also the title of the movie) is scheduled to air. The storyline involves the father of a murdered girl taking the law into his own hands after the police fail to arrest her killer after he escapes from prison. Though The Beast is available in English in the UK, we aren't aware of any US editions. Sharon Sala's second thriller in the "Searchers" trilogy, Blood Ties, is this week's free title. Click on the banner above to start shopping! About Blood Ties (from the publisher): Savannah Slade is not the person she thought she was. The reading of her "father's" will has led her to a world-shattering revelation: her sisters are not her blood kin—and she may be the heiress to a massive fortune. Her not-quite-fiancé Judd doesn't care where she came from—he only wants her by his side. But the primal need to uncover her past wins out, and Savannah trades the Montana ranges for Miami's moneyed oceanside enclaves. The wealthy and powerful Stoss family is less than overjoyed to find that Gerald Stoss's daughter has emerged from the past. But theirs is a clan seldom troubled by … inconveniences. They've always had the means to eradicate any blemish on their perfect lives. One more won't make a difference. Mike Ripley's excellent monthly ezine, Getting Away With Murder, is out with its September 2011 edition … and its scope this month spans the world, with articles featuring crime novels and films from New Zealand, South Africa, China, Italy, and, of course, the UK. Entertaining and informative, there's likely to be something of interest for all fans of mystery and suspense. 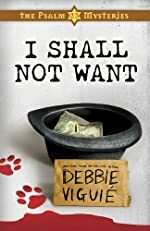 MystereBooks is pleased to feature I Shall Not Want by Debbie Viguié as today's free mystery ebook. We don't know how long it will be offered at this special price (typically only until a certain number of downloads have been completed), so we urge you to download it while it is still available for free. This series of mysteries feature church secretary Cindy Preston and Rabbi Jeremiah Silverman, who were introduced in the 2010 book The Lord is My Shepherd. A third book in the series, Lie Down in Green Pastures, was published earlier this year. About I Shall Not Want (from the publisher): Charity work can be murder! It’s Thanksgiving and Joseph Tyler, one of the members of Cindy’s church, has organized a new charity that provides homeless people with rescue dogs to love and care for. But one by one, the homeless recipients are being murdered and their dogs stolen. Could an overly competitive millionaire with his prize-winning pooches and a grudge be behind the crimes? Or could it be someone much closer to Joseph who has something sinister to hide? Cindy and Jeremiah must rush to find a killer before he strikes again. 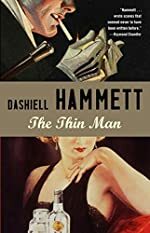 It's been a few months since we've had any news on Johnny Depp's adaptation of Dashiell Hammett's 1934 novel The Thin Man. The last we heard Jerry Stahl was writing the screenplay with Rob Marshall directing. Now we're learning that David Koepp (Jurassic Park, Panic Room, Secret Window with Depp, Angels & Demons) is on board to write the script for Marshall to direct. We also thought Depp wanted to make the film contemporary a la BBC's new Sherlock adaptations, but Deadline|Hollywood is now reporting that it will be a period piece. Regardless, this film seems to be years away from reality so we're expecting more changes as the months go by and will keep you posted. About Strange Images of Death (from the publisher): Provence, 1926. Scotland Yard detective Joe Sandilands plans to drop his niece at an ancient château on his way down to the Riviera for a much needed holiday. A troubling crime committed at the château just before their arrival leaves a clear message that more violence is to come. To allay panic, Joe agrees to stay on and root out the guilty person. But, despite Joe's vigilance, a child goes missing and an artist's beautiful young model is murdered in circumstances eerily recreating a six hundred-year-old crime of passion. About the author: Born in the north of England and a graduate of Durham University, this former teacher now lives in Cambridge. Her Joe Sandilands series, set against the background of the Indian Empire, was inspired by the contents of a battered old tin trunk that she found in her attic. 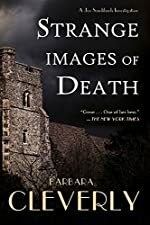 Crime novels by Barbara Cleverly reviewed by Mysterious Reviews: Folly du Jour (2008) and Strange Images of Death (2010). 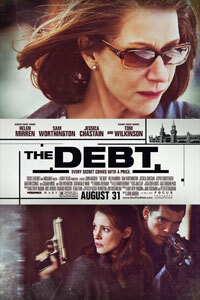 The political thriller The Debt has a rare Wednesday debut, and will open in theaters tomorrow, August 31st. The story begins in 1997, as shocking news reaches retired Mossad secret agents Rachel Singer (Helen Mirren) and Stephan Gold (Tom Wilkinson) about their former colleague David Peretz (Ciarán Hinds). All three have been venerated for decades by Israel because of the secret mission that they embarked on for their country back in 1965-1966, when the trio (portrayed, respectively, by Jessica Chastain, Marton Csokas, and Sam Worthington) tracked down Nazi war criminal Dieter Vogel (Jesper Christensen), the feared Surgeon of Birkenau, in East Berlin. While Rachel found herself grappling with romantic feelings during the mission, the net around Vogel was tightened by using her as bait. At great risk, and at considerable personal cost, the team’s mission was accomplished … or was it? The Debt is a remake of the 2007 Israeli film Ha-Hov. Watch the trailer for the film below. 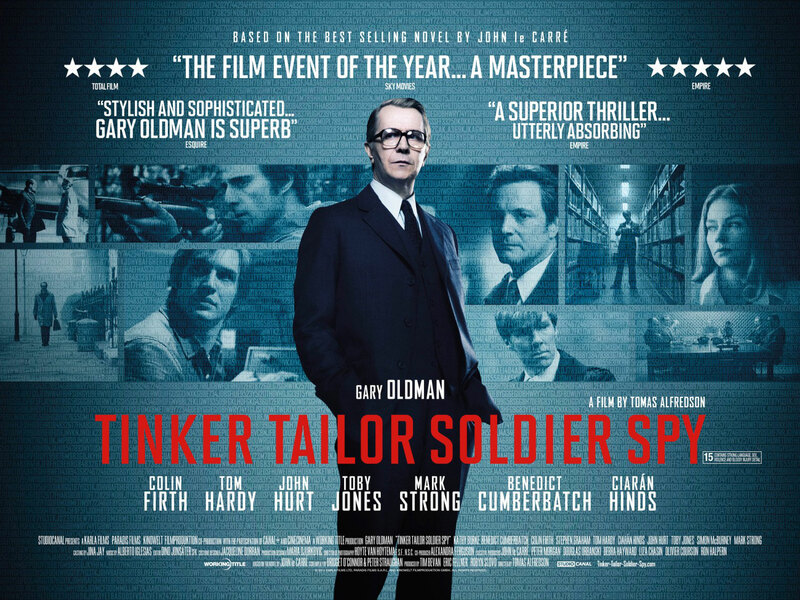 A new UK quad poster has been released for the film Tinker Tailor Soldier Spy, adapted from the bestselling spy thriller by John le Carré. Click on the image for a larger version. It's a variation on others we've seen, but this one shows all the principals in the cast. Gary Oldman stars as retired MI-6 agent George Smiley, who is tasked with finding a mole within his former organization, only to learn that it can only be one of his most trusted colleagues. 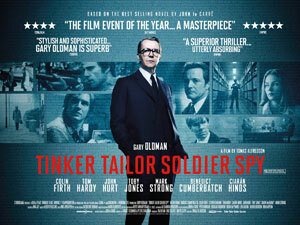 Tinker Tailor Soldier Spy, which also stars stars Colin Firth (Bill Haydon, "Tailor"), Mark Strong (Jim Prideaux), Benedict Cumberbatch (Peter Guillam), Ciarán Hinds (Roy Bland, "Soldier"), Toby Jones (Percy Alleline, "Tinker"), and Kathy Burke (Connie Sachs), opens in US theaters November 18th, 2011. The Medusa Plot by Gordon Korman. 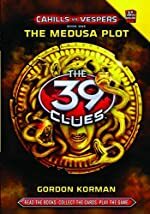 The 39 Clues: Cahills vs. Vespers Series. Scholastic Hardcover, August 2011. Though they have solved the mystery behind the 39 clues, the adventures for Amy and Dan Cahill continue when they are blackmailed into stealing the famed Medusa painting by Caravaggio in this exciting first book of a new series for pre-teens. Read the full text of our review at Mysterious Reviews: The Medusa Plot by Gordon Korman. 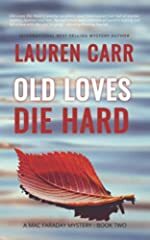 Omnimystery News is pleased to welcome back Lauren Carr, author of the Mac Faraday mysteries It's Murder, My Son and Old Loves Die Hard. Though we often think of mysteries in terms of series characters, the supporting cast is usually just as important to the stories. Today Lauren writes about one of these characters that plays an important role in her books, Gnarly, the canine anti-hero. I shouldn’t have been surprised; but I was, when It’s Murder, My Son, the first installment in the Mac Faraday Mysteries, was released and everyone loved the dog. Oh, they loved Mac Faraday, too. He’s a great guy. Handsome. Down to earth. Daring. Sincere. Rich. Who couldn’t love Mac? But everyone really loves Gnarly, the delinquent German shepherd that was part of Mac’s multi-million dollar inheritance. Reviews have ended up on dog lover websites. Who am I to complain as long as they’re good? Dogs are popular. According to WikiAnswers, 44.8 million people in the United States have at least one dog. In the last 15 years, the amount of money spent on pets in the U.S. jumped from $17 billion to $43 billion, according to a U.S. Times article. I am certainly not the first author to include canine characters in my mysteries. Both Susan Conant and Carol Lea Benjamin have very successful mystery series that center around dogs. In It’s Murder, My Son, we first meet Gnarly when he’s standing on Mac Faraday’s chest threatening to rip his throat out. Less than an hour later, he steals Mac’s lunch. One of his previous owners, the woman next door whose murder Mac investigates, was sued by another neighbor for paternity after Gnarly raped their purebred champion poodle. This overly intelligent German shepherd has the distinction of being the only dog to have been dishonorably discharged from the United States Army. Something the military still refuses to talk about. This is not to say that Gnarly is vicious or completely unruly. A dog trainer explains that Gnarly is highly intelligent to the point of canine genius. Easily bored, he looks for trouble. Okay, so we love dogs. Gnarly is a dog. Therefore, we love Gnarly. But Gnarly is a bad dog. Is it because our love for dogs knows no boundaries of good or bad? Yes, but there’s more to it than that. Not only is Gnarly a dog, but he’s also the anti-Lassie, a canine antihero. We can’t wait to see what Gnarly will do next because we don’t know what he’s going to do next. If Mac fell into an abandoned well, Gnarly would go get help … after raiding all the food at a family reunion on the way to the police station, at which time we’ll discover that Gnarly was the one who dragged Mac into the well in the first place. We like not knowing what’s going to happen next. Take, for example, Agatha Christie’s Miss Marple or in more modern times, Jessica Fletcher. Heroes that I’ll love until the day I die. I cut my teeth on Perry Mason and Hercule Poirot. However, from page one of a Miss Marple book, we know with all your heart that in the end, Miss Marple is going to prove the wrongly accused innocent and catch the killer. While these mysteries are entertaining, they’re also predictable, and so are their heroes. We know what our heroes are going to do. They’ll always do the right thing for the right reason. I remember when episode 4 of Star Wars was released. This was the blockbuster that first introduced Luke Skywalker and Hans Solo to the world. Luke the hero wants to go off to save Princess Leia because it is the right thing to do. Hans Solo, the antihero, on the other hand, must be bargained with before he’ll fly the Millennium Falcon to the rescue. In the end, Luke saves the rebels by blowing up the Death Star. Even as we hung onto our seats, we knew Luke would do. He was the hero and heroes always win. But we were all surprised when Hans Solo, the antihero who left before the big battle, came back to help Luke save the day. That was a pleasant surprise. It is that unpredictability that makes antiheroes, especially canine anti-heroes with big soulful brown eyes, so much fun. Gnarly coming to the rescue is much more exciting than Lassie’s. Can Mac hang onto the edge of the cliff a little bit longer while Gnarly makes a quick detour to rob the butcher shop on the way? Hey, it’s a mystery. There’s supposed to be suspense. Lauren Carr fell in love with mysteries when her mother read Perry Mason to her at bedtime. The first installment in the Joshua Thornton mysteries, A Small Case of Murder, was a finalist for the Independent Publisher Book Award. A Reunion to Die For was released in hardback in June 2007. Both of these books are in re-release. 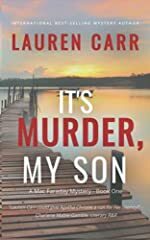 Last year, the first installment of her new series, It’s Murder, My Son was released. The Mac Faraday Mysteries take place in Deep Creek Lake, Maryland, where Lauren and her family vacation. The second installment is entitled Old Loves Die Hard. Both are getting rave reviews from readers and reviewers. About It's Murder, My Son: What started out as the worst day of Mac Faraday's life would end up being a new beginning. After a messy divorce hearing, the last person that Mac wanted to see was another lawyer. Yet, this lawyer wore the expression of a child bursting to tell his secret, which would reveal Mac as heir to undreamed of fortunes, and lead him to the birthplace of America's Queen of Mystery and an investigation that will unfold like one of her famous mystery novels. About Old Loves Die Hard: Old loves die hard … and in the worst places. Mac Faraday, an underpaid homicide detective who inherits two-hundred-and-seventy million dollars and an estate on Deep Creek Lake, Maryland, from his birth mother on the day his divorce becomes final, is settling nicely into his new life at Spencer Manor when his ex-wife Christine shows up — and she wants him back! Before Mac can send her packing, Christine and her estranged lover are murdered in Mac’s private penthouse suite at the Spencer Inn, the five-star resort built by his ancestors. 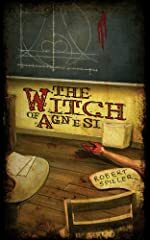 MystereBooks is pleased to feature The Witch of Agnesi by Robert Spiller as today's free mystery ebook. We don't know how long it will be offered at this special price (typically only until a certain number of downloads have been completed), so we urge you to download it while it is still available for free. Bonnie Pinkwater is a schoolteacher in Colorado, and is featured in three mysteries in this series. About The Witch of Agnesi (from the publisher): Bonnie Pinkwater cares about her students. So when Peyton Newlin, a thirteen-year-old math genius, disappears, Bonnie starts nosing around. One by one, students who were competing with the young genius start turning up dead and Bonnie suspects Peyton may be narrowing the field. Then Peyton himself turns up murdered. Bonnie's investigation ratchets up. Earlier this month we reported that the television rights to the crime novels by Leif G. W. Persson featuring Stockholm police officer Evert Backstrom had been acquired by 20th Century Fox. Now we're learning that Fox Television has committed to filming a series pilot based on the character. The author, who throughout the 1990s wrote numerous television episode screenplays in his native Sweden, will serve as co-executive producer for the studio. At present, there are only two books in the Evert Backstrom series, neither of which (to our knowledge) has been translated into English. Persson is also the author of a separate series of crime novels featuring Swedish police inspector Lars Martin Johansson. TNT is reportedly interested in developing a crime drama with a private investigator, who operates his business out of a pawn shop in Los Angeles. Even the title makes us cringe a bit: Bishop to Pawn. The pedigree of the script cannot be questioned, though, having been written by Greg Plageman, whose previous credits include episodes of NYPD Blue, Law & Order, Cold Case, Chase, and the new Person of Interest. The executive producer attached to the project is also A-list: Jerry Bruckheimer, whose prime time crime credits are far too numerous to list here. Still … a pawn shop? We'll have to wait and see how far one this goes. A mysterious new website has appeared for The Hunger Games: TheCapitol.pn. (Keywords on the page include "Hunger Games", "Panem", and "Capitol", so the intent of the site isn't a mystery … through the legitimacy of it remains, at least in our opinion, in doubt. We're guessing .pn is supposed to stand in for Panem; it's actually the Pitcairn Islands.) The home page is simply a wavy image of what appears to be the outline of a coliseum or something similar. The only link on the page is attached to "Hello citizen. Identify yourself." It requests you log in with your twitter account, but the terms are far too onerous for us — allowing the app to follow new people, update your profile, and post tweets on your behalf. We're wondering how legitimate the site is, and its purpose, so if someone braver than we are gets through, we'd be curious to learn what you find out. NBC has acquired the US television rights to the Israeli television thriller Smoke Pillars (or Pillars of Smoke) with the intent of producing a stateside version. In the Israeli series, titled Timrot Ashan, which is starting its second season, the police investigate a cult from the Golan Heights that has mysteriously disappeared. With little assistance from the local population, the lead investigator discovers a political conspiracy with potential environmental consequences. Some websites are describing the series as a cross between Twin Peaks and Lost. We watched the opening credits online, and though we don't read/speak Hebrew, just the visuals and soundtrack have us leaning far more towards Twin Peaks than Lost; quite frankly it reminded us more of True Blood than anything else (though we didn't see any evidence of vampires!). Death and the Maiden by Gerald Elias. A Daniel Jacobus Mystery. Minotaur Books Hardcover, August 2011. The mystery of a missing violinist is well crafted and has its fair share of surprises for the reader, but the overall storyline involving the staging of a multi-media performance of Franz Shubert's "Death and the Maiden" will probably appeal most to those who also take an interest in the arts. 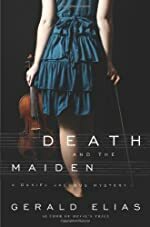 Read the full text of our review at Mysterious Reviews: Death and the Maiden by Gerald Elias. 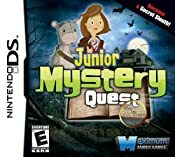 Become a secret sleuth in Junior Mystery Quest, a hidden-object adventure game designed especially for younger Nintendo DS players. The Tibutton family's Uncle Alester is missing, and DS detectives must explore a spooky old mansion to figure out what has happened to him. As they move through the story, from room to room, players use the stylus to seek out objects on the touch screen that are cleverly drawn into each scene. The main characters are kind and friendly, and the game's story is intended to be challenging and exciting, but not too scary for children. Junior Mystery Quest is scheduled to be released on Tuesday, August 30th, 2011, for Nintendo DS. It is ESRB rated E for Everyone. CBS is developing a crime drama based on the series of April Woo mysteries by Leslie Glass. 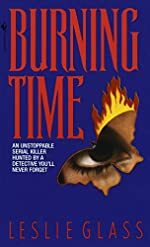 The first book in the series, Burning Time, was published by Bantam in 1995. April Woo is a Chinese-American detective with the NYPD. In her first outing, she is assigned to a routine missing persons case that converges with the hunt for a serial killer, who sears his signature of fire into the bodies of his victims. There are nine books in the series, the most recent of which, A Clean Kill, was published in 2005. Amy Bloom (Lifetime's State of Mind) will write the screenplay for the pilot and executive produce. Telemystery, your source for one of the most comprehensive listings of crime drama, amateur sleuth, private investigator, mystery and suspense television series, mini-series and made-for-television movies, now available on or coming soon to DVD or Blu-ray disc, is profiling four series being released this week. Jim Belushi and Jerry O'Connell star as The Defenders in this short-lived series set in Las Vegas. Nick Morelli (Belushi) and Pete Kaczmarek (O'Connell) are the local go-to guys with an eclectic client list, who are still looking to hit their own jackpot. While Lady Luck shines on their legal careers, the partners have their hands full when it comes to their personal lives. With Pete busy cruising the Vegas Strip for his latest romantic conquest, Nick is focused on repairing a fractured marriage to his estranged wife and remaining present in the life of their young son. The Defenders: The Complete Series (and labeled as "The DVD Edition") is available on DVD and iTunes (click on the icons above for more details), and consists of 18 episodes that originally aired on CBS from during the 2010/2011 television season. 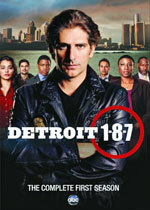 The crisis, revelation and heartbreak of some of Detroit's finest are on display as a group of inner city police agree to have their days filmed by a documentary crew in Detroit 1-8-7, a highly praised though low rated crime drama that lasted just one season on ABC. Leading the officers is Lieutenant Maureen Mason (Aisha Hinds), a single mother struggling to balance her work and home lives. New partners Louis Fitch (Michael Imperioli) and Damon Washington (Jon Michael Hill) are paired for their knowledge of the city and heroism on the job. But homicide work is never easy, and these cops are soon tested by the crime-ridden city in which they live. 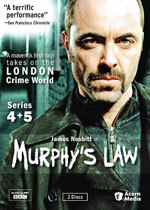 James Nesbitt stars as maverick Irish police officer Tommy Murphy in Murphy's Law. Guilt-ridden over the death of his young daughter, who was slain by the IRA, he flees to London to work undercover for the Metropolitan Police. Murphy's Law: Season Four and Five is available on DVD (click on the icon left for more details), and consists of 6 episodes that originally aired on BBC during August 2006 and October 2007. Also available, and being released this week, is Murphy's Law: The Complete Collection, which includes all 22 episodes of the series. 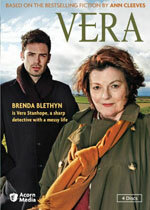 Brenda Blethyn stars as Detective Inspector Vera Stanhope in Vera, based on a character created by crime novelist Ann Cleeves. Three of the episodes are adapted from novels in the series. Set in and around Newcastle in scenic Northumberland County, Vera solves baffling crimes in the area with her trusted partner Detective Sergeant Joe Ashworth (David Leon). Vera: Series One is available on DVD (click on the icon left for more details), and consists of four episodes that originally aired on ITV in May 2011. The network has confirmed that a second series of Vera is in production.